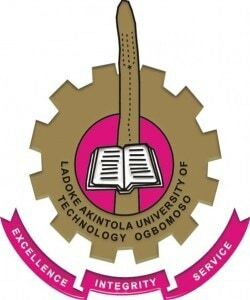 The management of Ladoke Akintola University of Technology, Ogbomoso, LAUTECH, is inviting suitably qualified candidates to its 2018/2019 academic session post UTME Screening Exercise that has been slated to hold on Friday, 27th July and Saturday 28th July, 2018 at 10:00 am prompt. Candidates MUST has chosen LAUTECH as their FIRST CHOICE (Preferred Choice) during the 2018 UTME. All the candidates who scored a minimum of 160 and above in the 2018 Unified Tertiary Matriculation Examinations, UTME are eligible to apply for the screening test. The LAUTECH Post UTME Screening application form will be available online for completion and submission as from Friday, 27th July and Saturday 28th July, 2018 at 10:00 am prompt. Eligible applicants should visit the college’s portal at: www.admissions.lautech.edu.ng and purchase the screening form at the rate of Two thousand Naira (N2,000.00) only, for the purpose of online registration for the screening exercise using Inter-switch Enabled Debit Cards (ATM). You are expected to carefully complete and submit the online application form. According to the management, incomplete LAUTECH Post UTME application form will not be treated. In completing the online application form, applicants are expected to upload a digital copy of their scanned passport photograph which must be in JPEG (i.e. jpg) and must not be more than 20kb. The photograph must be in white background showing ears, with no cap and glasses. When you have successfully completed and submitted the online application form, you are to print out an acknowledgement page which assigns you the venue of the screening exercise. The Ladoke Akintola University of Technology, Ogbomoso, LAUTECH Post-UTME Computer Based Test (CBT) Screening Exercise has been scheduled to hold between Friday, 27th July and Saturday 28th July, 2018 and the time is 10:00 AM Prompt. Late completion/submission of the screening forms will not be entertained. Any candidate with blurred picture on the acknowledgement page will not be admitted for the screening exercise as the photograph will be used as means of identification. Any candidate who fails to present himself/herself for the Computer Based Test (CBT) as scheduled above, will automatically forfeits being considered for admission. Applicants are advised to come for the exercise with their acknowledgement page colour print-out from the online registration. The use of cell phones (GSM, CDMA, PDA) and other electronic devices will NOT BE ALLOWED during the test. All correspondence should be sent to admissions@lautech.edu.ng. The Sale and submission of LAUTECH Post UTME Screening application form will end on Thursday 26th July 2018. You have the chance as anybody. Get the required cut-off marks and you are in. Yes, you can apply for the post utme screening. Your admission will depend on your Post UTME Score. Does lautech accept nabteb for admission? ?